Cargo is a solution for sending and receiving large numbers of files via e-mail and FTP. The solution makes it easy for your contributors/customers to send large files with the correct information attached. Cargo makes it possible to preflight files directly in a web browser, giving both sender and receiver full control over files, metadata and status of files. With the online preflight module you can check incoming files for errors before arriving in production, and it automatically gives feedback to the sender if the file was according to standard. The web forms are customizable, so your customer only needs to fill out the form with your requested information and press send. No special FTP client is needed. 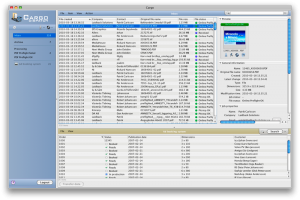 For users who upload files frequently there is a small desktop application where the user can upload without using a web browser. 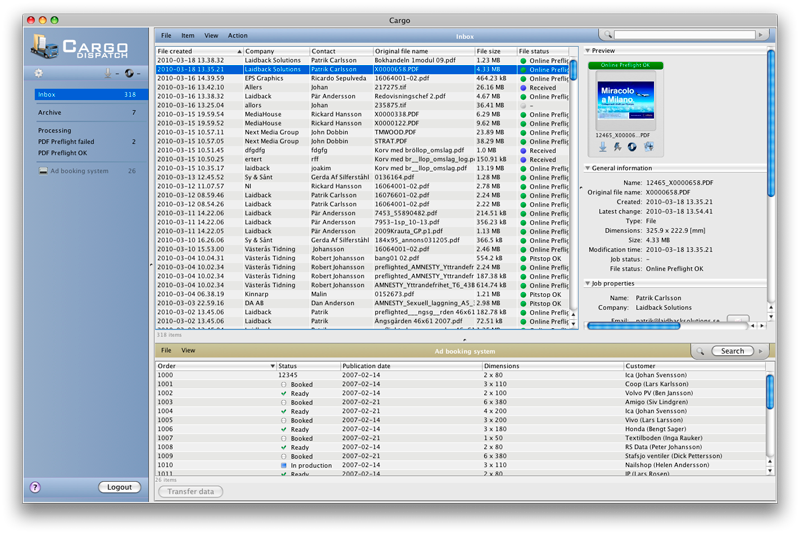 “Cargo Sender” allows users to upload and send large number of files by a simple drag & drop. Small – Suitable for smaller Companies. One inflow, one customizable web form. Also included in all versions is Cargo Staff and Cargo Admin. Medium – Same as the Small Version. In addition it includes as many different web forms as you like. The Medium version also includes Cargo Sender, which you can give to as many of your frequent users as you wish. Large – Large is the same as the medium version but with the addition to automate your workflow – any kind of moving, copying, adding metadata to images, picking up files from an FTP server or e-mail. The automation tool that is integrated is FileTrain. XLarge – All functionality. Plus the option to search a 3rd party SQL database (SQLServer, Oracle, MySQL).